Availability: Held once per year, usually in August. Schedule not usually available until March. This is a four day, three night workshop. The workshop includes lodging (dorm style), 3 GREAT meals a day, instruction and on-site photography in one of the most interesting places in the world. 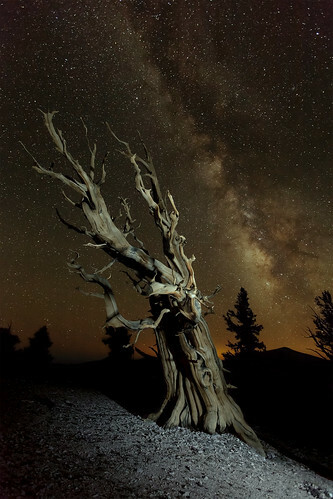 The Ancient Bristlecone Pine trees – the oldest known living organisms on the earth are gnarled and bent by the fierce winter conditions and the slow growth of a short season. Cost is usually around $800 per person and includes dormitory style lodging and meals, not including travel costs. NOTICE: Lodging is at high altitude – about 10,000 feet. The air is thinner and you may experience altitude sickness ranging from minor to severe. The thinner air is most noticeable when you exert yourself. Also note that there is 15 miles of unpaved road to travel from Schulman Grove where White Mountain road pavement ends to Crooked Creek Research station. A “low rider” car will definitely have trouble, but in the past regular passenger cars and mini-vans have come and gone just fine. There were two people who reported getting flat tires on the way out, though! Having a full sized spare is always a good idea! Would you like to be the first to know when this event is scheduled (it usually sells out in a week or two!)? Yes, the please subscribe. I would like to be notified when the August Bristlecone workshop reservations will become available. I am interested in two spots. And another event the following month.